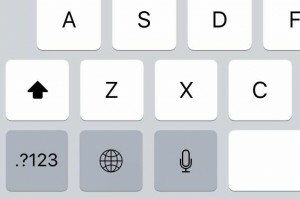 On your iPad or mobile phone, press the microphone icon to dictate in notes, emails, or other applications. Make sure you check the results later on. You may need to edit the content. The same applies for other suggestions below. 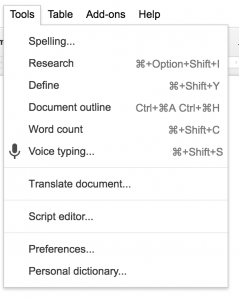 Google Docs now allows you to dictate as well. It is called “voice typing” under “tools”. Give it a try. It is fairly accurate. 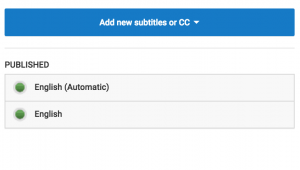 If you upload a video to Youtube, Youtube can automatically transcribe your voice into subtitles which you can then improve into more accurate ones. The automatic process saves you at least half of the time compared to doing it from the scratch. However, if you do not have the time for lengthy editing, you might consider using a professional service. 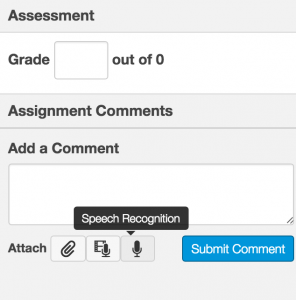 When grading student work in Canvas, you can use voice comments to give feedback to students, or use the Speech Recognition tool (works in Chrome) to have your comments turned into text. 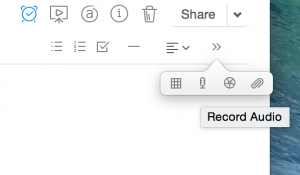 If you use Evernote, you can leave yourself a voice note instead of typing it. I hope this gives you some ideas of using voice to make input easier and faster. This entry was posted in Canvas, Instructional Design, Tips, tools by Berlin Fang. Bookmark the permalink.